I love spinach. I love the taste of spinach. I love it raw with strawberries and apple cider vinaigrette. I love it sautéed with feta and cherry tomatoes. I love it on my pizza. I love the savory flavor and the mouthfeel. I love how cheap it is and how easy it is to use. When I am looking to bump up the nutrition in anything, I find a way to add spinach. That’s why I fell in love with these spinach muffins. I minimally adapted the recipe- you can find the original here. 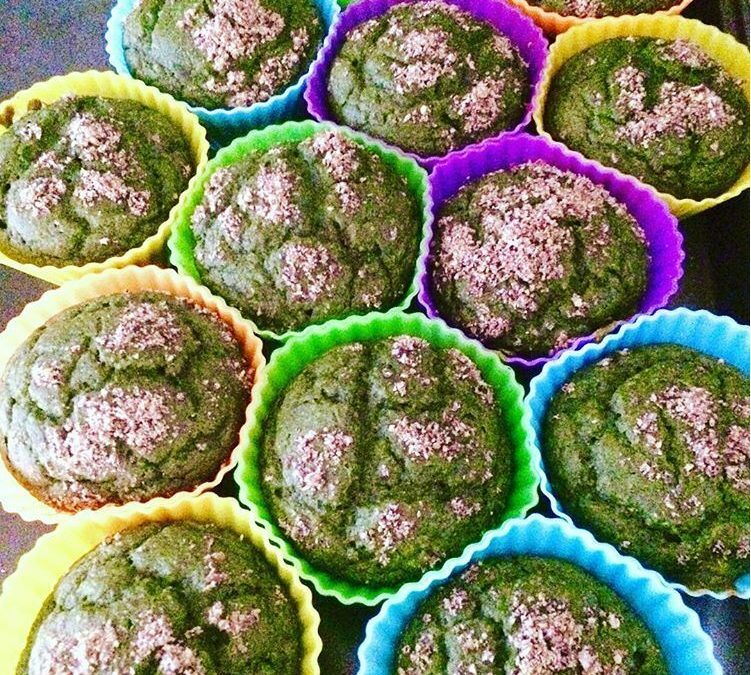 Each muffin (assuming 12 muffins in a batch) has a whopping 1/3 cup spinach! But what does it taste like? To me, it tastes like a banana muffin. And the bright green color is so much fun for kids! Spinach is a powerhouse of nutrition. It’s high in fiber, iron, magnesium, potassium, manganese, copper, zinc, certain B vitamins, vitamin K, vitamin C, and folate! You’ll also find many antioxidants. This all adds up to spinach being a super immune booster! This recipe is such an easy one to use with toddlers. They love putting the ingredients in the blender and “making circles” with the dough before it goes in the oven. 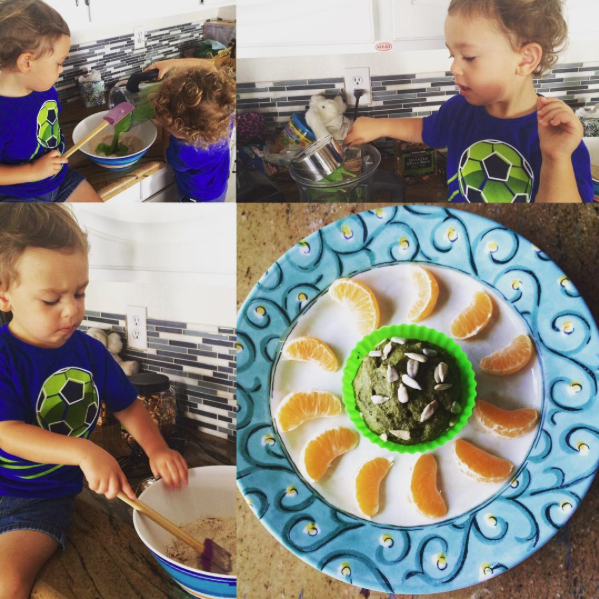 And, as you can see in the pic below, my boys also loved helping top the muffins with flax and almond meal! The added benefit of involving your kids in the kitchen is that they can see what goes in the recipe an know that they love the outcome! Cooking with kids is a great way to spend quality time together and to expose your kids to new and interesting foods. If they helped make it, they are more likely to be open to try it! In a blender, place oil, milk, and spinach, banana and vanilla; blend until pureed. 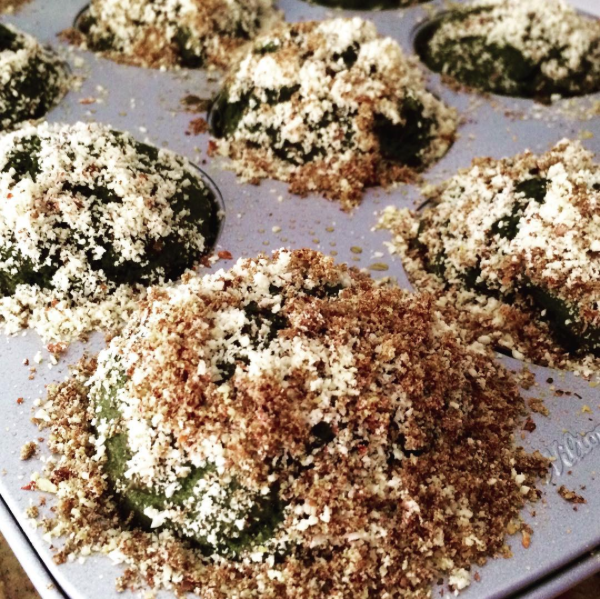 You can top with almond meal, flax meal, chopped nuts, dark chocolate chips, or shredded coconut!